For the power consumption values, Qualcomm had wired up some meters to the battery connects in each device. This gives the overall system power, not just the power of the chipset, so that includes the display, the connectivity, and anything else that might draw a microjoule or two. 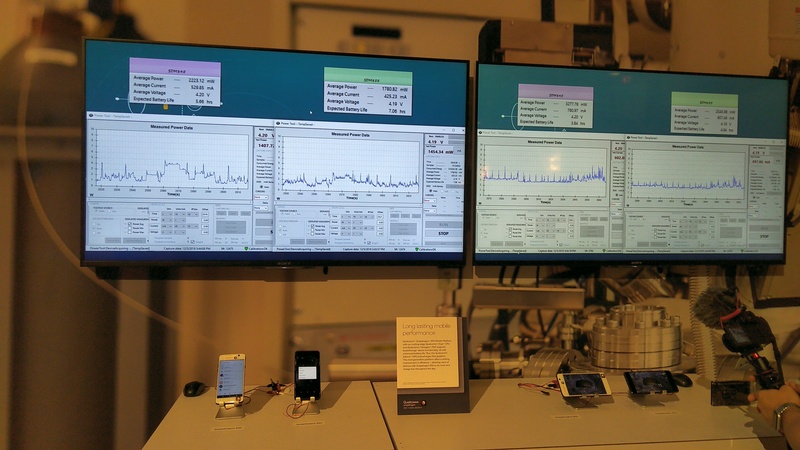 On the first pair of devices, Qualcomm was running through a script of random web based searching. The script allowed for automation, and it was continually loading a set of known webpages fresh without cache lookups. This is a fairly light test, but it does stress the radio a fair bit as well as a changing display that has a lot of white area. 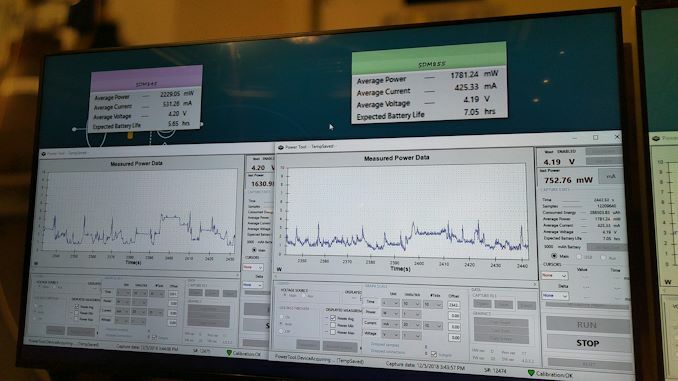 Overall it showed that the S845 system was using an average power of 2219 mW, while the new S855 system was at 1778 mW. In the grand scheme of things, this is 20% less power. For the second demo, Qualcomm went for gaming. Firing up PUBG, we were told that the two devices were fixed into a 40 FPS mode with identical quality settings. This was also a scripted test, with the player jumping out of the plane onto the ground and quitting out. This obviously requires a bit of radio in order to connect to the online server, and there would be a small disjoint between the two games based on server latency. 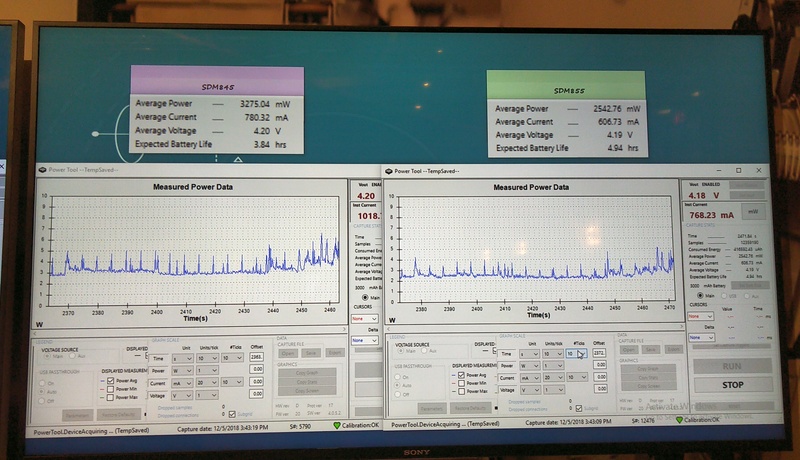 Values for these tests put the S845 at an average power of 3276 mW, and the new S855 at 2543 mW. The difference in this test would be 22%. All of this is well and good, although one big caveat came up: none of the screens were brightness calibrated. The Qualcomm representative said that the brightness of the devices was ‘eyeballed’ to be in the same region, however based on personal experience, that’s never a guarantee and they could be out by as much as 20-30%. The panels were also not from the same manufacturer, so there’s a question of panel efficiency as well. All being said, this is perhaps not unexpected (or rather, showing power at this point is unexpected). There has to be some obfuscation as Qualcomm has to manage expectations but also the final tuning needs to occur. On top of that, it will be up to Qualcomm’s OEM partners to put the SoC into an environment that may or may not be efficient for radio, display, thermals, etc. We’ll wait until we get some hands on with the hardware until we make any judgements. Funnily enough, I have my display calibration tool with me. To be fair, Qualcomm stated that they’d allow me to equate the screen brightness on both, which was a nice gesture, but we haven’t characterised the workloads they were using, and there was no chance I’ll be allowed to run our power tests at this point. Stay tuned, as power efficiency is going to be an interesting story here. More likely that they catch up in the next 2-3 cycles. Apple's been catching up to Intel/AMD for the past few cycles. They probably get one more cycle due to not having to pay the x86 legacy tax. After that, we'll basically be doing single-digit updates just like Intel/AMD.